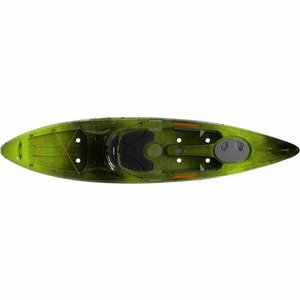 The Perception Pescador 12.0 kayak’s versatility makes it popular for both recreational paddlers and anglers. Extreme stability ensures a drier ride that’s easier to get in and out of. The 375 lb. capacity rating packed into a 12-foot kayak means plenty of room for you and your gear. Compared to its shorter sibling, the longer length adds speed, storage, and stability. Multiple storage options, fish-ready features, and an incredibly comfortable seat keep you on the water for longer. The Pescador goes beyond the competition by introducing high-end features, like ergonomic seating, to the everyday paddler. The Comfort Seating System with thick cushioned padding has an adjustable seatback that reclines forwards or backwards for customized support. Easily adjustable footrests customize fit for paddlers of all sizes. Wide enough to be incredibly stable, yet sleek enough to slice through the water, the Pescador offers the perfect balance of fun and performance. Whether cruising or fishing, it’s fast-turning, straight-tracking, and easy-paddling design helps new kayakers quickly gain confidence. Offered in three sizes, the Pescador’s speed, storage, and stability increase with each size. The 13.5 tandem model accommodates two paddlers while still being a blast to paddle solo. The Pescador is engineered and tested to be among the safest kayaks available with built-in buoyancy and stability that lets you relax on the water. Its high weight capacity improves stability even further. Ready to fish right out of the box, it’s also easy to customize thanks to multiple gear tracks and molded-in Solo Mount recess for mounting rod holders, cameras, and more. Lightweight and easy to carry, the Pescador’s molded-in handles also double as lockable security points for outdoor storage. Like all Perception kayaks, the Pescador is designed for maximum durability and optimized weight. This is the result of its high-density polyethylene and one-piece roto-molded construction that provides exceptional UV, impact, and abrasion-resistance. Unlike comparable models, the Pescador includes an easily replaceable skid plate for added protection when dragging your gear-loaded kayak to the water. Ocean and saltwater-optimized hardware and finishes allow you to take your Pescador anywhere you please for years to come. As the world leader for kayak innovation, Perception® Kayaks has introduced more people to paddling than any other brand. In fact, we pioneered modern kayak design and construction over 40 years ago. We’re a company of passionate paddlers and we design our kayaks for comfort, stability, durability, safety, and performance. Our proprietary resin and innovative rotational molding process provide superior strength and light weight in a leak-proof one-piece construction. Roto-molding also allows us to integrate features and vary thickness throughout for strength and stability where needed, without added weight. The result is a lineup of the most comfortable, versatile, and easy-paddling kayaks with unmatched UV, impact, and abrasion-resistant. They can even be recycled! Best of all, every Perception kayak is proudly designed, molded, and hand assembled in Greenville, South Carolina, USA. With a reputation for reliable quality and innovation, we invite you to experience the Perception Difference.